Ministry of Home Affairs MHA Intelligence Bureau (Ministry of Home Affairs) is scheduled to conduct Assistant Central Intelligence Officer (Grade-II/Executive) i.e. ACIO Tier I exam on 25th Feb 2018. 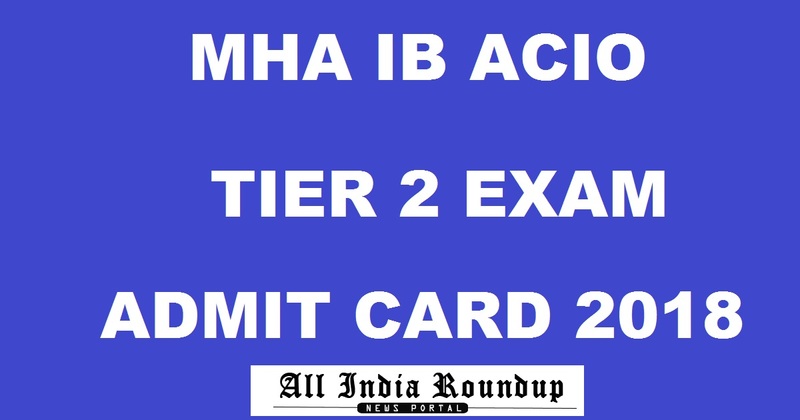 All the candidates who had qualified in the prelims exam are searching for the MHA IB ACIO Tier II admit card as it is the crucial document to carry for the exam and contains details regarding exam venue, roll number etc. MHA IB is sending ACIO Tier II admit card to the registered Email address. Candidates who had not received the admit card can download from the direct link provided below or MHA will send soon. The Intelligence Bureau (IB) is India’s internal intelligence agency and reputedly the world’s oldest intelligence agency. It was recast as the Central Intelligence Bureau in 1947 under the Ministry of Home Affairs. It conducts various examinations for filling up vacancies with eligible candidates in various departments. This year IB released notification for the Assistant Central Intelligence Officer posts and the candidates who had cleared the Tier I exam can download admit card from the official website. Ministry of Home Affairs has released notification for the recruitment of candidates as Assistant Central Intelligence Officers. There are 1430 vacant positions for which the notification is released. A large number of eligible and interested candidates applied and appeared for the exam. Candidates who had qualified in Tier 1 can download admit card from the direct link provided below. The Tier 2 exam is of the descriptive type which consists of 2 sections. Part A will be of 30 marks in which the candidates will have to write an Essay on one of the given topics, while Part B will have 20 marks for English Comprehension & Precise writing. The duration of the exam is 60 minutes. 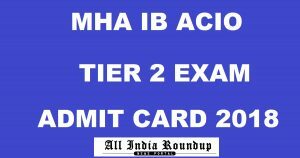 How to Download MHA IB ACIO Tier 2 Admit Card 2018? Click on MHA IB ACIO Admit Card 2018. Note: MHA will send ACIO Tier 2 exam admit cards to the registered Email address. Stay tuned to this website. We will update MHA IB ACIO Tier 2 Results here. Press CTRL+D to bookmark this page for easy navigation.